Hi Friends: I am very excited to share that I am part of the new design team at JessicaLynnOriginal stamps. Jessica offers Clear Photopolymer stamps, Custom Rubber stamps, and Digital images. I am really in love with her designs and can't wait to share more examples with you. Today's card features the Limited Edition Brentwood Owl Farmhouse Wreath digital stamp. Isn't this simply darling? If you decide that you love him as much as I do, please put my name in the notes to seller when you order him. As part of the announcement, you have a chance to win a gift certificate in the JessicaLynnOriginal store, so please pop over to the Facebook page and enter for your chance to win! I printed the image onto smooth white cardstock and colored it with my Spectrum Noir markers (colors listed below). I fussy cut the image, added some crazing medium to enhance the feathers and some glossy accents to his beak, then glued the image to a doily cut from the Kaisercraft papers. For the base layer, I cut the Kaisercraft papers to fit my A7 card base, then used my sewing machine to add texture and interest. 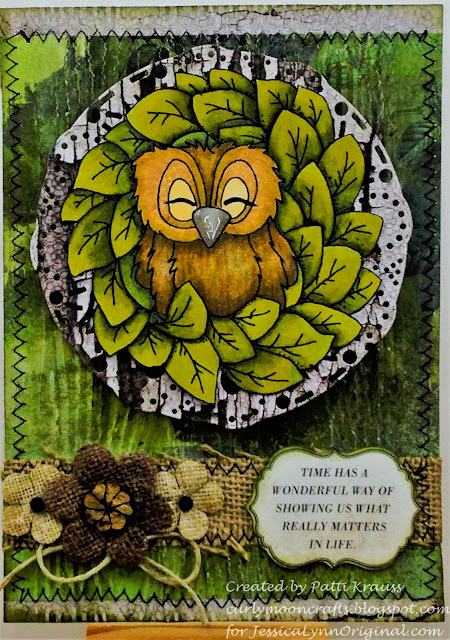 I also used the woodgrain embossing folder on the base layer to add more texture, then used the Forest Moss ink to enhance the texture and distress the edges. I sewed a strip of burlap paper at the bottom on the layer, then glued it to the card base. For dimension, I used some foam dots to pop the focal image in the center. To finish, I added some burlap flowers, a twine bow, and my sentiment along the burlap strip. I love your work!! The blending of colors is gorgeous. Congratulations to a talented lady!! Congratulations! And your work is so Beautiful! This is such a beautiful card! I love all the rustic texture you created for your adorable little owl. And I love how he is nestled in a wreath of leaves! I also thought the sentiment went perfectly with the scene you built. This made me smile and I'm so glad you shared your talents with us for this week's Simon Says Stamp Monday Challenge! This is such a great design - I love how much colour you packed into the card - fabulous.